Sometimes you want over the top, sauce laden, maybe even cheesy pasta; and sometimes you just want plain and simple. 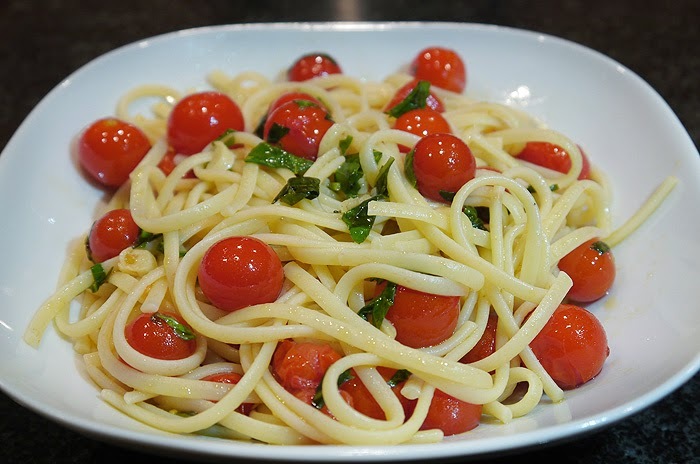 My version of plain and simple; a few cherry tomatoes, sauteed in some good quality olive oil and tossed with pasta and fresh basil. This month my Virtual Potluck Group teamed up with Carapelli Olive Oil and each of us will be giving away 3 bottles of their delicious oil (see details below). I used the Carapelli Extra Virgin Olive Oil in this simple pasta dish and it was perfect; imparting just enough flavor but not overpowering. Heat the olive oil, crushed red pepper and garlic together in a medium pan, till garlic becomes fragrant. Add tomatoes and cook about 1 minute. Add salt to taste and remove from heat. Cook pasta till al dente. When ready toss into pan with tomatoes, add basil and place back on heat. Cook about 1 minute to warm it back up. Remove from heat and serve with some grated Parmesan cheese. This is my kind of pasta - light with beautiful colors and easy to prepare. Love it! Just saw we were supposed to post what we cook with olive oil...we cook as many things as possible. It's much healthier! I think the first thing I'd cook with the olive oil is the delicious cherry pasta you've pictured here. It looks elegant and delicious. I love pasta with tomatoes! this looks divine! I would cook some veggies.